Home Demolitions - 730 MILLION DOLLAR STADIUM THAT WILL COST TAX PAYERS Home demolitions are the experts in home and building demolition with professional processes and services at affordable rates in Sydney. The SFS designed by Phillip Cox has become an iconic sporting arena to the Sydney siders. The Stadium has seen many sporting events, creating history that the crowds echos will long live on within the amphitheatre. With 58 percent of voters opposing the state governments stadium policy, including knocking down the SFS. 36 percent strongly support the government building stadiums and 4 percent are undecided. This Stadium has brought us some the funniest and greatest moments in the history of sporting events. The debate is are we Sydney siders ready for a new stadium? Let's not forget all the weird and wonderful events that have entertained us on the Stadiums fields. Like this guy! Remember him? That’s Wati Holmwood. A real health concern to the stadium at the time and the many eyes that saw him. Who doesn’t love a good laugh though when a streaker runs on the field during a State Of Origin match. Sure fans and players were upset but it made a memorable moment. AND THATS A TRY! Might need to go the video referee on that one. Streaker Wati Holmrood Making a dash across the feild! The dancing Flamingo with the big BOOTY!!! WHO CAN FORGET ELMO THE PITCH INVADER! 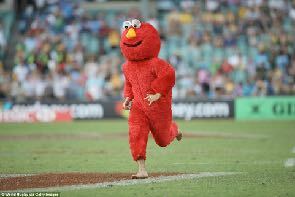 How we can forget ELMO and his mate the COOKIE MONSTER storming the pitch during a Rugby match in Sydney’s Rugby Sevens. It seemed the Cookie Monster lost his head and was contained by security. However his mate Elmo broke free and stormed the field. It’s Elmo the pitch invader! Let's not forget all the crazy fans this iconic Stadium has attracted over the years creating some awesome atmospheres to be around when watching your favourite sporting events. The Smurfs gang are back again! GO THE BLUES!!! The Government has signed a contract with Lendlease, and stage 1 involving demolition is due to commence after the New Years test series between Australia and India at the adjacent SCG. The demolition process is expected to take up to 12 months to complete. It involves demolishing the existing Sydney Football Stadium, ancillary buildings and tree removal. The redevelopment of the SFS represents the next phase in this history of the precinct, ensuring that the site remains at the heart of the Eastern City’s major sporting events for the next 50 years and that the history of the site and precinct is carried on. Let's hope that when the new Stadium does go up we have many more years of weird and wonderful sporting history and not to mention all the greatest moments as well. The stadium has brought many great moments such as Cathy Freeman’s win in the 400m sprint, the Rabbitoh’s historic grand final win in 2014, the Socceroos' victory over Uruguay that got us into the 2006 world cup, and of course, the opening ceremony of the 2000 Sydney Olympic Games that launched the fleeting career of pop ‘icon’ Nikki Webster.